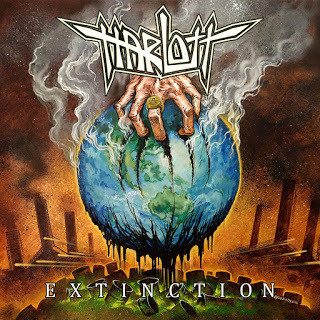 Drawing from their storied history, Australian thrashers Harlott have emphasized the 80’s Bay Area thrash scene and blending it with the Teutonic melody and grit, they focusing on high energy, up-tempo music with lyrical influence from war, religion, chaos and the human condition. Bringing new guitarist Jake Weber onboard, the groups’ third full-length effort was released April 7, 2017 on Metal Blade Records. Offering their strong, raging sound to its fullest, there’s not a whole lot to dislike here as the band brings their full-throttle attack to its fiery best. Efforts like the blistering title track, First World Solutions and No Past are based mainly around a churning, driving series of riffing that brings out plenty of utterly ferocious rhythms here, diving and bombing into galloping territory bringing out the fullest intensity in these rhythms. Playing most of these tracks are dynamic speed-drenched numbers complete with crunchy patterns, a thunderous rhythm section and a truly intense drive to crush forward with the oppressive riff-work featured here as the need for the fastest, most ferocious riffing possible carries this one for the most part here. When this one drops off that intensity for melody like The Penitent, Better Off Dead or And Darkness Brings the Light there’s still plenty of ferocious rhythms around this blistering attack that it really manages to hold itself quite nicely here as the deeper churning patterns allows this to feature plenty of blistering sections while managing to sound close enough to their general sound without being recognizably off from the general attack. There is a case to be said here about the album being somewhat overlong with a few too many tracks here which make it feel somewhat like a slough in the second half to plow through even more of the same general attacks over and over again. It works nicely but trim this by a song or two and it would improve significantly.